Pratipada Shraddha is done for those deceased family members who died on Pratipada Tithi, including both Shukla and Krishna Paksha Pratipada. Pratipada Shraddha is also known as Padwa Shraddha. After the tarpan ritual, pind-daan is performed and the offerings are either given to a cow or immersed in a river. 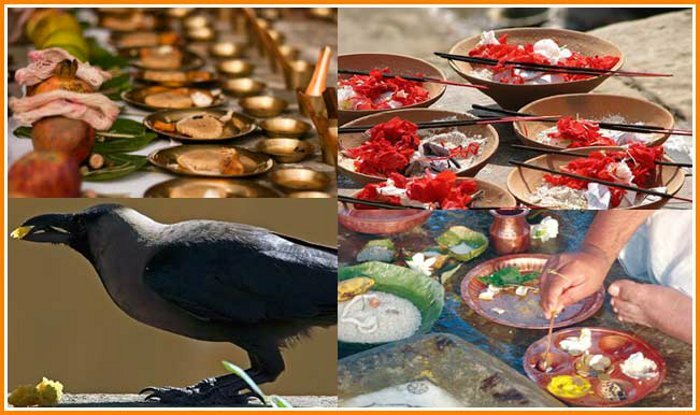 Pratipada Shraddha rituals are done during the suitable time so that the prasad can be eaten during the ‘Aparahna’ or afternoon time. After the completion of all the rituals, the prepared food is first offered to a Brahmin and later eaten with all family members. The tarpan and pind-daan rituals are done to offer peace to the deceased people. It offers liberation from the cycle of birth and death, resulting in salvation. Kasha, Gaya, Prayag Sangam, Rishikesh, Haridwar and Rameshwaram are important pilgrimage places for performing the Pratipada Shraddha. It is believed that by observing the Pratipada Shraddha rituals bring prosperity and happiness at home. The period is also known as Pitru Pakshya, Pitri Pokkho, Sola Shraddha (“sixteen shraddhas”), Kanagat, Jitiya, Mahalaya Paksha and Apara paksha. Pitru Paksha is considered by Hindus to be inauspicious, given the death rite performed during the ceremony, known as Shraddha or tarpan. In Hinduism, Shraddh is the rituals performed by relatives for the departed souls of ancestors, parents and relatives. It is a way of telling them that they are still an important part of the family and they still reside in our memories. Period of Shraddh is also known as Pitru Paksha. Pitru Dosha arises if one does not perform the rituals of Tarpan in Shraddh. When to perform a Paksha Shraaddha? As we approach towards middle of Bhaadrapada Masam as per Hindu Lunar Calendar, it is time to worship the departed souls (forefathers). This worship is held for a period of 15 days during the waning period (dark period) of Moon in the second fortnight called as Krishna (Bahula) Paksha of Bhaadrapada Masam that generally occurs during the months of September–October every year. The period of 15 days starting from Bhaadrapada Bahula Prathama to Bhaadrapada Bahula Amaavaasya is called Pithru Paksha or Apara Paksha or Paksha Masam when Sun will be transiting Kanya (Virgo) raasi in the zodiac. This period is totally dedicated and earmarked for worshiping the departed souls (forefathers). Why should one perform Pithru shraddha ? Maathru Devo Bhava; Pithru Devo Bhava; Aachaarya Devo Bhava; Athithi Devo Bhava; Worshipping these four is given highest significance and importance in Hindu Dharma. Among the four, Mathru (Mother) and Pithru (Father) Aachaarya (Guru) have attained greater prominence since they are the people who are responsible for our birth, culture (samskaara) and existence. They are the one who have contributed for our welfare and growth; they are our friends; philosophers and guides; they are our mentors and our role models. Maata-Pithru seva (serving parents) when they are alive and performing Pithru Yagna after their departure has been prescribed as the best way to get discharged from Pithru Runa. Why only during this period ? Actually oblation to Pithrus is prescribed to be performed on a daily basis through Brahma Yagna; through Shannavathi (96 specific days during a year); during Parva kaala like Uttaraayana; Dakshinaayana; Eclipse etc; during Pithru Paksha (Bhaadrapada maasam); through annual ceremony; theertha/kshethra sraaddha etc. Out of which the one during Pithru Paksha is given greater prominence. Mahaalaya Pithru Paksha occurs during Dakshinaayana; also known as Pithraayana Dakshinaayana represents Pithrus. It is believed that Pithrus descend on Earth during the period of Dakshinaayana in anticipation of their progeny perform sacred rites enabling them to attain better placement in other worlds. Hence, lot of significance is given during this period for performing Pithru related activities. Pithru Paksha also coincides with Chaaturmaasam the most sacred period for worshiping both Deities as well as Pithrus. It is the most auspicious time to pay our obeisance and salutations to forefathers. Hence, it is specifically referred to as Pithru Paksha. It is also called Mahaalaya. Maha means great or big or large. Laya means destruction. Mahaalaya means great destruction. It is said that during one of the occasions of Deva-Asura Sangrama (war between Deities and Demons) large number of Devathas and Rishis had died at the hands of Raakshasas starting from Bhaadrapada Bahula Prathama (Paadyami) to Amaavaasya. This Mahaalaya is also called as Sasthrahatha Mahaalaya. These Deities and Rishis are like our forefathers and it is befitting to worship the departed souls during this fortnight that coincides with Mahaalaya. Hence, this period of 15 days has become very sacred and celestial for performing sacred rites to forefathers. As per Hindu time element one month for human beings is equivalent to one day for Pithru Devathas out of which Sukla Paksha (waxing moon days) 15 days is the day time and Krishna Paksha (waning moon days) 15 days is the night time for Pithrus. It is believed and said that sacred rites like Thila Tharpana and Pinda Pradhana (offering of rice balls) performed during Pithru Paksha acts as food for the departed souls that will be adequate for them throughout the year. Hence, Paksha Shraaddha is required to be performed during dark fortnight (Krishna Paksha) of Bhaadrapada maasam. What are the specified days for Paksha Shraaddha? Paksha shraddha is actually prescribed to be performed on all the 15 days except on Ekaadasi day. Since it is not practically possible to perform on all the days; it should at least be performed for one day preferably on the day corresponding to the Father’s Thithi (death day). Rest of the days at least, Thila Tharpana should be given to Sarva Pithru or at least to Dwaadasa Pithru (three generations on paternal side and three generations on maternal side). On the day of Mahaalaya Amaavaasya Thila Tharpana should be given to all the eligible forefathers. In case a person due to some reason misses to perform the rituals on the said date; or doesn’t know the Father’s death thithi; it can be performed on any one of the other specified days viz. On the day of Vyatheepaatha Yoga; Mahaalaya Amaavaasya. During Krishna Paksha there will be no Pournami thithi. Hence, for those Pithrus whose thithi (lunar day of death) happens to be Pournami (full moon day), rites should be performed on any of the other specified days mentioned above. If one misses to perform even on any one of the specified days; still one can perform on any day before Aaswayuja Sukla Panchami. Even then if it is not possible; still one can perform Paksha shraddha on any of the specified days mentioned above during Thula Masam when Sun is in Thula Raasi (Libra) before He transits into Scorpio (Vrischika Raasi). Those performing daily Thila tharpanam or Paksha shraddha during Paksha maasam should perform on all days except Ekaadasi; including Yati Mahaalaya and Ghaatha Chaturdasi. Where to perform the Paksha Ceremonies? As per sacred texts it is suggested to perform Paksha ceremonies on the banks of sacred rivers or in sacred and celestial places like Gaya, Kaasi, Prayaaga, Kurukshetra, Naimisharanya, Rameswaram etc. If it is not possible they should be performed at least in one’s house. But in view of several practical difficulties and intricacies involved, they are being performed at various temples and religious mutts specifically meant for that purpose. For example; all branches of Sri Raghavendra Swamy Mutt; Sri Uttaradi Mutt; Udupi Mutt and other dhaarmic institutions across the country provide such facilities to the Karthas. Who can perform these Ceremonies? One who is a Dwija (undergone the process of Upanayana) should start performing these ceremonies, only after the death of his father. In such a case it should be performed by the son and not by the daughter. When more sons are available it should be performed by all collectively in case they are staying together; otherwise individually at their respective places. In case a person doesn’t have sons, widow of the deceased by making a proper sankalpa can get it performed through a Brahmin. What are the items required for these ceremonies? 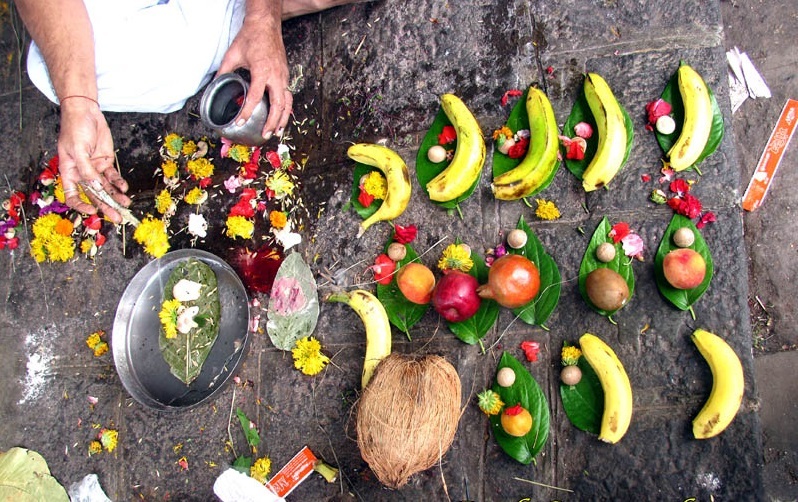 Dharbha (Kusa Grass); Cooked Rice; Black Sesame (Thila seeds); Water; Thulasi leaves; Ghee; Honey; Pavithra (made with Dharbha); Vishnu Paadam (foot print impression of Lord Vishnu); Kalasha; Panchapaatre; Uddharne; Copper plate; Poorcha; Areca nuts; Coins; Betel leaves; Plantains (Bananas); Gopichandana, Yagnopaveetha etc. Sraddhaaya charitam shraddha; literally shraddha means the one that need to be conducted with utmost sincerity, attention, care and devotion. While essence remains same; procedure, customs and rituals may differ from region to region; according to sampradaya; based on Varnaasrama dharma. shraddha should be performed wearing a ring made with Dharbha called Pavithra. Strictly speaking shraddha has to be performed in the direct presence (Pratyaksha) of two Brahmins. In view of practical difficulties it is performed generally with their symbolic presence by using Dharbha called Dharbha Braahmana; one representing Pithru Devathas called Pithru Braahmana;the other representing Visvedevathas called Daiva Brahmana. Agni Kaarya will be performed first and then Pithru Kaarya. In view of intricacies involved in the process; it is better performed under the guidance and supervision of a learned Purohit who is specially trained for the purpose. Pindaas are made with cooked rice and mixed with Thila (sesame seeds); During Pinda Pradhaana; rice balls (Pindaas) are arranged in a specific order on Vishnu Paada (foot print of Lord Vishnu) kept on Dharbha (Kusa grass). Left over Anna (cooked rice) after making Pindaas will be treated as Pithru Prasaada (Pithrusesha). Specification for the size of Pindaas is “Sameepathra Pramaanena” that means it should be of the size of a Samee tree leaf. Dharbha; Thila (black sesame seeds); cooked rice are the three major items widely used during the rituals. They are highly sacred and celestial. Dharbha from hair; Thila from the sweat have surfaced from the body of Lord Vishnu. Dharbha is used for sanctity. Anna (cooked rice) is so sacred and celestial that it is called ParaBrahma Swaroopa; personification of the supreme Lord SrimanNaaraayana the primordial person. “Annam ParaBrahma Swaroopam” It is not only used during Pithru Kaarya; but also during Agni Kaarya while performing several sacrifices viz. Homa; Yajna etc. Pindaas made with Anna are symbolic representation of forefathers. forefathers are dwelling; it is prescribed to perform Pithru Yagna in seven forms (Saptaanna) the ritual being called Chataka shraddha. It is believed and said that the rituals performed reach the departed souls through the rays of Sun God (in Hindu astrology Sun is referred to as the natural Pithru kaaraka); and Vasu, Rudra and Aditya acting as intermediaries. During shraddha three generations of fore fathers are identified as Vasu, Rudra and Aditya, assumed as Pradyumna; Sankarshana and Vaasudeva forms respectively of Lord Vishnu. What should be done when shraddha could not be performed? * When nothing is possible; pray & offer a sincere Namaskara. On these days perform these rituals, without fail, without counting upon the benefits one has derived from fore-fathers. If not started earlier, start doing it at least now. Better be late than never. Today’s alive are tomorrow’s forefathers. Next articleWhy Should One Perform Pitru Shraaddha?